Paddington Bears to be exact. Fifty Paddington statues have popped up in London as part of the promotion for the Paddington movie. I noticed one several weeks ago and when I searched online I found out that the bears will be on display until December 30th. Each statue has been designed by an artist, designer, and even some celebrities have joined the fun. If you visit the website, you can find a map and several suggested trails. So far I’ve tracked down thirteen of them. Some of the statues will be auctioned online and all the proceeds will go to charity. I found an area called Little Venice during my Paddington Bear quest. I’ve been in London for three years, and I didn’t know there was a place called Little Venice. It’s not my favorite spot in London, but Miles likes it since it isn’t so crowded and he likes to peer over the edge into the water, making me uncomfortable. I can just picture him tumbling in and me having to jump in to save him. 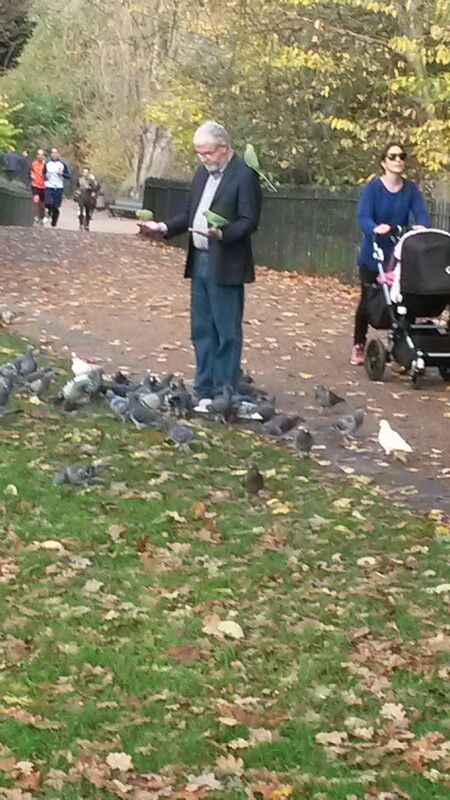 I know this is totally random, but last week I was wandering through Kensington Gardens and I saw this man. The birds love him! Before I go, I want to apologize for not blogging much lately. There has been a reason. A very good reason. 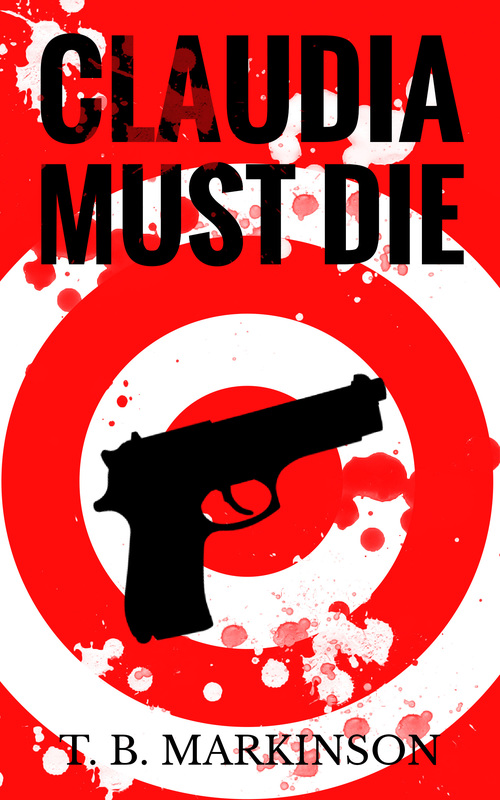 I’ve been preparing my fourth novel, Claudia Must Die, for publication. And it’s finally ready! Actually you can pre-order a copy on Amazon for the sale price of 99 cents until December 7th. The e-book will be officially released on December 8th. The plan goes horribly awry. Instead of murdering Claudia’s double, the assassins shoot the woman’s lover who is the cousin of a powerful Irish mobster. Claudia becomes hunted by all involved. Can she survive? Should she? I hope everyone has a fabulous weekend and that the upcoming holidays aren’t stressing you out too much. This entry was posted in Life, London and tagged Claudia Must Die, Life, Little Venice, London, Paddington Bear Trail. Bookmark the permalink. Love the bears that seem like tourists! Cheers to your literary efforts, and good luck the new release. Meanwhile .. it’s Friday, so reason to toast a Cheers at the pub of choice. It’s a tad bit cold so the pub across the street is looking really tempting. And some mulled wine will hit the spot. Have a great weekend! I hope all of you enjoy the movie. Oh, that’s awesome. I love Paddington! And it’s neat that finding the bears has led you to explore new places. Are you going to try to find all 50? I’ll do my best. It’s a great way to explore. How cool!!!! We had something similar but with cows few years ago!! Have a great X-mas!!!! And congratulations for your work!!! I’m sure Miles will make sure we go during the spring. Happy holidays to you and your family. I know the new book will do well 🙂 Congratulations! He’s so cute and I’m loving finding the statues. Miles is enjoying the “hunt” as well. Paddington’s are cute and I’ve seen them all over social media! And yay for a new BOSTON based book. I love the cover of this one and can’t wait to check it out. Thanks Geoff. Boston is a great setting to work with. I hear you haven’t had too much snow yet. Nothing like Buffalo. Nope a couple of dustings so far, but my sister out in Western MA got close to 18 inches a few weeks ago! Yikes. So early in the season. I LOVE the Paddington Bear statues. If I was in London I would be looking out for them. Congratulations on your new book and all the best of luck! I haven´t been blogging much either as we just made a huge move to Spain from Canada. Lots to learn but I think you know all about that. I hope you are getting settled in. Moving to a different country is fun, but it can be time-consuming. I’m so excited for you! Can’t wait to hear all the stories. Yayyyy for Claudia and oh boy the Paddington Bear movie looks hilarious :). I saw the trailer the other day. I bet it’s a cute movie. I mean, it has Paddington. I thought you usually stayed away from your computer on Saturdays LOL. Usually I do. Had the urge to chat today. Awww, you miss all your blogging buddies :). Ahh I’d like to see the bears! They are everywhere. Hopefully you’ll get a chance. Hooray, your book is ready! We love Paddington Bear…is there perhaps a statue of him inside Paddington Station? Little Venice is one of our favorite spots when we want quiet time in London. The boat houses there are so interesting. Next time you are there look for this unusual little bridge: https://en.wikipedia.org/wiki/The_Rolling_Bridge. Little Venice does provide quiet time and hardly any tourists. We’ve been exploring a bit more. I love seeing the boats. Oh I need to check out the bridge. I wonder what Miles will think of it. Have a great weekend and congrats on your new book launch! That would be pretty cool. Haven’t seen his name yet. Thanks Jackie! I love those bears! In spring artists painted Easter eggs that were hidden throughout NYC before going on display in Rockefeller Center. Later, they were auctioned off. Planting 50 Paddington bears all over London in anticipation of the release of that film is brilliant marketing. Maybe you can sneak a hard copy of your latest tome into one of his coat pockets? Congratulations on your upcoming release. Jackie gave you a nice shout out on her annual Great Books to Give list. I gave your latest to myself. You have another terrific cover. I remember seeing Easter eggs around London one year, but I didn’t search them out. Now I’m wishing I did since it’s a good way to explore the city. Thanks so much! I hope you enjoy Claudia. Thanks for sharing, it’s fun. We had cows a few years back like this and it was fun to see them across town. I’ve been to little Venice in London and we did the tourist thing: a boat tour. It was nice to do, seeing the city from another perspective and it’s quiet. I wish you the best with your new book. I haven’t done the boat tour yet. Maybe I should. Might wait for spring though. I think it would be really pretty that time of year. Miles has been camera shy lately. He doesn’t want to slow down. Ah, how cute that he went with you and helped you with your studies. Well done on your book launch TBM ! I came across Golden Paws in Green Park on my day out recently but had no idea what it was all about Lol until I looked it up ! Aren’t they all brilliant .. great photo share . I had no idea about the Paddingtons until I stumbled upon one. I think the idea is brilliant and I’ve been seeing people surrounding them. A great idea and perfect for this time of year. I have photographed one or two of the same Paddingtons that you have, so our paths have crossed! There are two trails apparently, one longer and one shorter. I have heard good things about the film. So now that you have been a Londoner for a few years have you read A Bear Called Paddington? Might be a bit different from your latest oeuvre! I’m not a 100% positive that I’ve read A Bear Called Paddington. I’m familiar with the story of course, but I have more memories of reading the Bearenstein Bears. Might have to track down a copy at one of the charity shops. You would know if you had read it. I promise. Love the bears! I used to enjoy the stories and the animated programme when I was little. I am not yet a kindle or e-reader owner but maybe Father Christmas will be kind 🙂 All the best with the book! Also, best of luck with your latest book release! That’s a good reason to disappear from the blogosphere, for sure! Their promotion is brilliant and a great way to get locals and tourists involved. Love the bear statues. Thanks for sharing them here. 🙂 Congrats on your new novel. I’ve just clicked for the kindle version. Looking forward to reading. Merry Christmas. The bears are an added bonus this holiday season. Thanks! I hope you enjoy Claudia. Happy holidays! Wow, congrats on another book! Best of luck with the launch. Aww, Paddington Bears–how perfect for London. Thanks! And the bears are wonderful additions to the city. It’s really making London more festive at an already festive time of year. you’re new book sounds like a great story!! I’ll have to check for a Kindle edition. Love the Bears – what a great thing and for charity too. It’s great seeing the bears and to know that they are donating money for children’s charities is fab. You are doing so well! Another book already! Yay! And the bears are so cute. Hope you enjoy the season. Thanks! I need to add your book to my TBR. Happy holidays! Congrats on the upcoming book, so great! I love all those bears, I saw them on the news but it must be so great to see them in person. I kinda like the one by Jonathan Ross. A very fun post, and congratulations on the new release!